You may have noticed when you go to L4’s Discovery Centre, PlaNet Pasifika that there are always very cool and beautiful artworks in the space. They usually hang from the high ceiling. 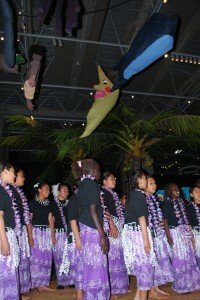 These artworks are created by children from various schools all around New Zealand. Staff go out to certain schools and work with them on creating amazing artworks especially for this area. The artworks up at the moment were created by thirty students from Room 5 at St Bernadette’s Primary School in Naenae, Lower Hutt. 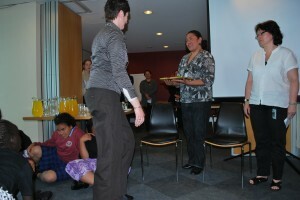 These were formally launched at PlaNet Pasifika, Te Papa on Tuesday 3 November 2009 at 9.30am. The launch involved a blessing of the artworks and a performance from the school’s culture group to celebrate the students’ achievement. 75 representatives from St Bernadette’s came along to this special ceremony. The artworks were inspired by traditional myths and legends from the Pacific Island communities in New Zealand – Tonga, Fiji, Samoa, Tuvalu, Tokelau, Cook Islands and Niue. Tell us what you can see in the picture – what is one of the stories behind it? 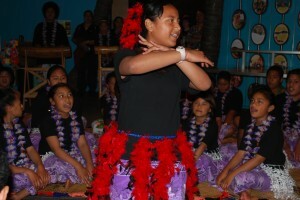 It was truly a wonderful experience to see the St Bernadette’s children, teachers and the caregivers arrive at Te Papa, all dressed up in their dance outfits carrying pate (Cook Island drums) and other musical instruments. It was clear that the day was going to be fun, exciting and memorable. 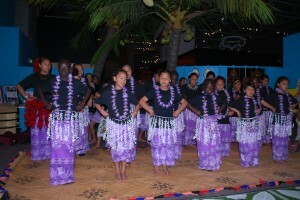 To the manuhiri’s (our guests’) amazement, they were welcomed into the warmth and calmness of PlaNet Pasifika by the Te Papa whanau, with the beautiful sounds of putatara (conch shells) and pukaea (trumpets). This put a smile and tears of joy to many of our visitors. 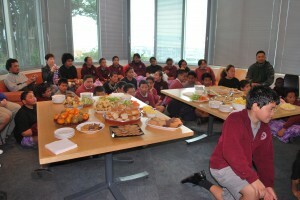 Following the Blessing ceremony everyone joined together for morning tea. We presented a small gift to the school, and each student was given a certificate of achievement to mark the special occasion. I am proud of the beautiful artworks that the students have produced. I am greatful for the time, commitment and effort that both St Bernadette’s school and the Te Papa staff put into this project and I am proud to be involved in such a magnificent project. What a joy…. These artworks will be on display here until October next year – come and see them. saint bernadettes school rocks.To all parents take ur kidz there it is a good enviroment, helpful teaches and a princapal that encourages u to learn and to never give up.the art work that was in te papa has been taken down.